Long active in Our Lady Immaculate parish, she held fundraising balls to help Catholic Charities. “They loved to dance, so I made them pay for it,” she says with a grin. And dance they did so that funds raised could purchase clothes and blankets for newborn infants in Catholic Charities foster care. Today, she is still active in her community, recently writing a letter to the Editor thanking our Catholic Charities home care aides and people in her community for responding to her recent medical emergency. Marielle Stone can be proud that even today she continues to make a positive difference in people’s lives. 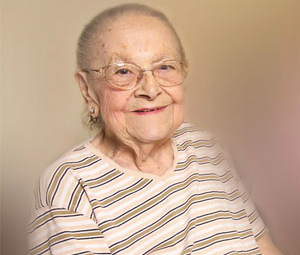 Marielle Stone was able to remain living in her own home with the help of Catholic Charities homecare aides until several weeks before her passing.